Where k is the spring constant (how loose or springy the spring is), x is the difference between the springs current length and its rest length, and F is the force on both endpoints of the spring. Usually one endpoint is fixed, the other is the one that bounces around- which is usually what happens: an initial impulse displaces the spring, the unfixed end of the spring acquires some velocity moving back, but it passes through the zero-displacement point, is pulled back in the other direction, and may bounce forever in the absence of any dampening forces. Physical springs have more complex behavior(like the transverse vibration and accompanying doing! sound when they're bent away from their axis) and could be described by more complex models but we'll start from the simplest model. The simple model seems bounce correctly, but then something odd happens: when the spring completes one cycle, it extends further out than the initial impulse pushed it, and then has that much more energy that it bounces back even further out in the next cycle. It goes out of control, oscillating uncontrollably and violating the law of energy conservation(which doesn't exist inside our system). We update our system a finite number of times during a spring oscillation, while the physical world 'updates' continously. 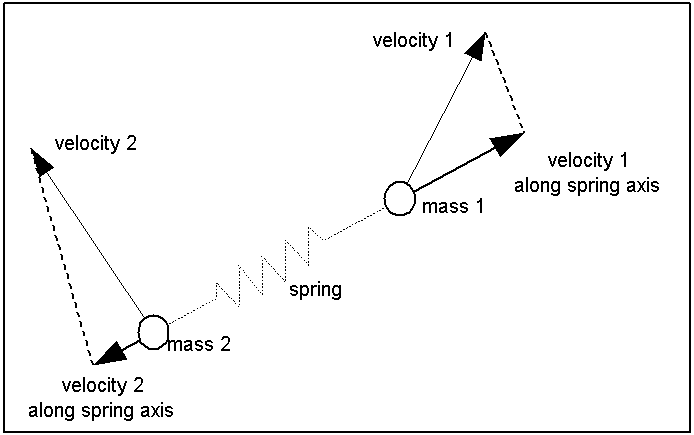 Each updates each impart forces on the mass that are then tell the masses how to change velocity for one time step, but really any arbitrarily small movement should result in a recomputation of spring forces, and new forces will tell our masses how to move differently. We can improve upon this by increasing the number of updates, but our computing resources and desire for other processing intensive happenings will limit how much we can do this. We could also solve the equations (with derivatives and integrals and so forth) that would tell us what forces are going to exist in the time inbetween updates, but this gets more difficult (if not impossible) for every additional attached spring. Probably our floating point coordinates that make up the vectors are only 32 bits. Operations that result in trailing digits are just rounded or cut off, and the more operations the more errors that will be accumulated. This is probably a much smaller problem than the first, but should be considered. There's a method call Range-Kutta that could does a sort of psuedo differentiation that might benefit the system, but for now we'll move on to dampers. A damper is kind of the opposite of a spring, except it operates on relative velocity rather than displacement. 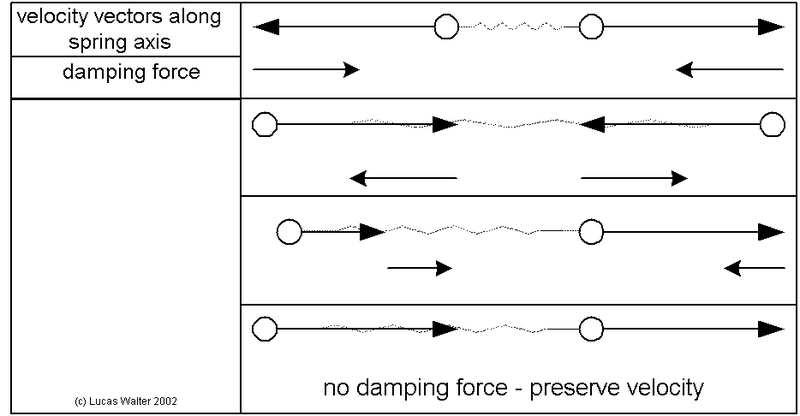 Spring endpoints moving away from each other will have forces imparted from the damper that will act against that motion (only on the spring axis, however), as well as endpoint moving towards each other. This will tend to return the spring to a static position. Also endpoints moving in unison will not be affected (the damper won't act as drag), and one endpoint unmoving and the other moving will average out to both moving slower than the one endpoint. And then what behavior do we want our damper to exhibit? In the actual code we can find the dot products after finding the change in velocity, which will be equivalent to taking the dot's then finding delta V.
The most time-consuming thing to do now is to create objects that will test the system. The single spring system should also be tested with a constant force (rather than a single endpoint), where the spring will bounce and then find a stable point where 'gravity' is matched by the spring restoring force. Also, if gravity is perpendicular to the initial spring orientation, the free mass should swing back and forth like a pendulum. 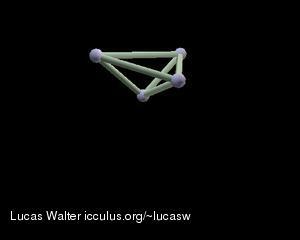 Hook up a 3d shape and see if perturbations make the shape collapse or if the setup is stable and the shape restores itself. A critical requirement for all of this is that behavior is exactly the same for when the system has some average velocity as when the average velocity is zero- which suggests testing the system by do just that (perhaps with a moving camera that will keep the system on screen, and a stationary background that will give the impression of motion). 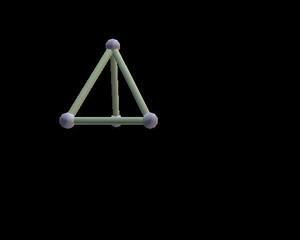 If you perturb a pyramidal (for example) shape just right it will begin to rotate, and problems arise: we aren't doing any rotational dampening, so roundoff errors may start the spring rotating increasingly faster (and the springs will stretch out as if we had implemented centrifugal 'force', which isn't a force at all in the cartesian system and which is why it doesn't need to be explicitly implemented in order to arise) and the pyramid blows up. It would be nicer if our system could somehow recognize instability situations and then dampen accordingly (as the above dampening will dampen linear motion as it does rotational, which is bad if you're trying to model bodies in space that shouldn't experience any significant drag). Again, non-Euler (not v=f/m,s+=v) methods may improve the situation and I'll explore that later. If Ks or Kd were larger than this, we could have a situation where the velocity imparted will move the mass into a such a distant position in the next cycle that the spring will respond by pulling back with an even larger force, giving a velocity back that will extend the spring even further in the next update, and we get the chaos I mentioned above. It's also generally best to normalize these constants to the size of the masses. What worked decently for me for a simple sphereical arrangement was to make Kd slightly larger than Ks, while still less than .5.